What is the effect of radiation on others? Receiving RAI treatment? You need Bind-It! I took the radioactive iodine, now what? Can’t I use bleach or regular cleaners? 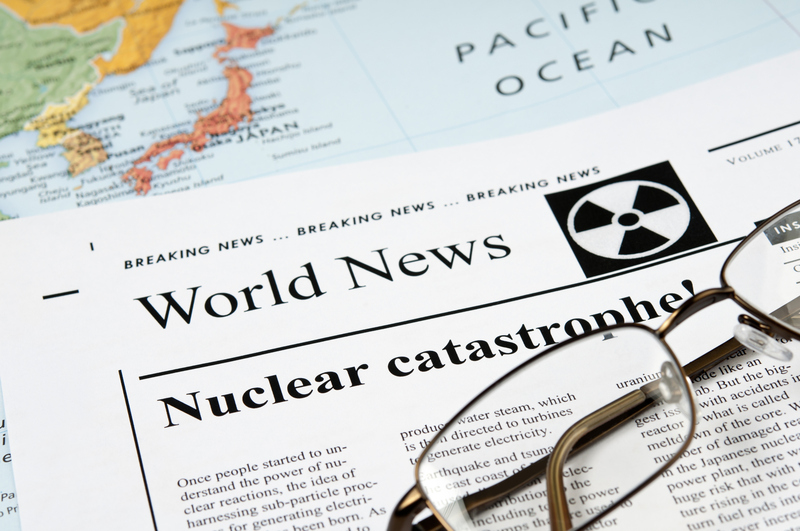 - - What is the effect of radiation on others? - - Receiving RAI treatment? You need Bind-It! - - Is home contamination real? - - I took the radioactive iodine, now what? - - Can’t I use bleach or regular cleaners? If you knew there was a safe and effective way to keep your Family protected from radioactive contamination, would you choose to do it? I131 will also pass out of your body through a sneeze, a cough, a runny nose, saliva, urine, stool, vomit, even your breath. Any surfaces you touch must be cleaned. If not cleaned promptly, that contamination will spread. When healthy cells are exposed to I131, they can mutate. Mutated cells may develop into cancerous tumors. Distance works well to protect others from gamma exposure. Radio-iodine treatment is intended for thyroid patients - not their families. Extra care needs to be taken, particularly with children, to ensure that every reasonable step is made to eliminate contamination you may come in contact with post-isolation. This is why Bind-It™ Patient Care Packs were developed. Most people’s knowledge of radiation comes from what they learned in high school science classes. Or what they see in movies (zombies roaming Chernobyl), or the media (Fukushima, North Korea, etc.). In short, it’s all bad. Now you are told that you will be swallowing a capsule of radioactive iodine to “fix” your thyroid problem. But - you have to go home - and stay isolated from your family for several days so you don’t expose and contaminate them. 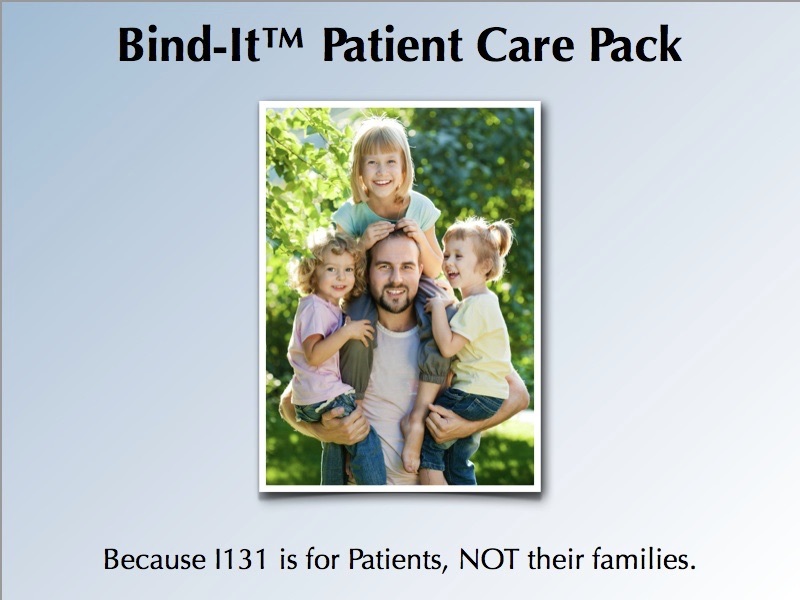 Bind-It™ Patient Care Packs give patients peace of mind because they are using products designed specifically to remove and prevent contamination. You are using the same thing that the nuclear medicine department uses to remove contamination. It’s like getting a prescription from the doctor. Is isolation & distance enough? Other countries isolate their I131 patients in-hospital. Isolation rooms get contaminated. Before another patient can use that room it must be decontaminated. Technicians that clear isolation rooms know how difficult radio-iodine can be to clean - even with the proper tools. Unfortunately in-hospital isolation isn’t always an option here in the U.S.
Just because we send patients home, we shouldn’t assume contamination is not an issue. Out-of-sight / out-of-mind doesn’t mean contamination isn’t there. This isn’t a hospital room -- this is your home. 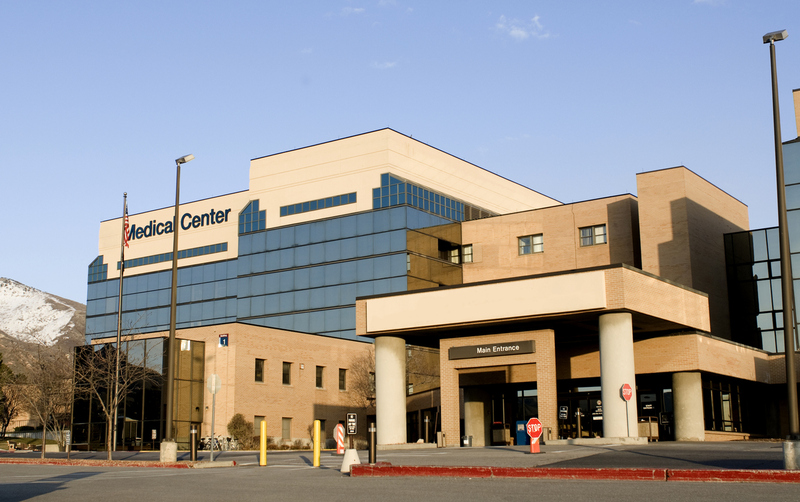 Patients in isolation should focus on recovery, not worry about contaminating family members. Ordinary household cleaners just don’t work well at removing radio-iodine. Worse yet, many contain bleach - which volatilizes I131 - and spreads it further. Finally, there is a way to give patients peace of mind - and allow them to minimize contamination in their home. 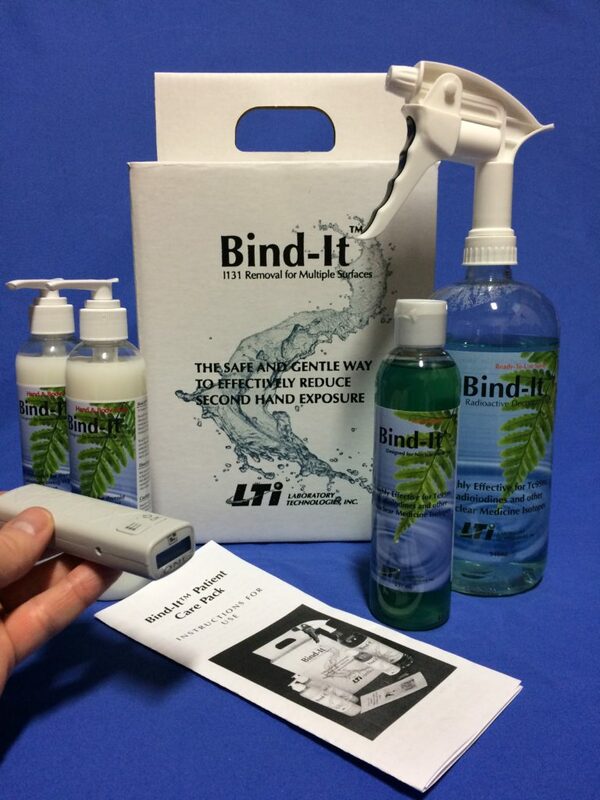 Only Bind-It™ is designed to safely and effectively remove I131 contamination. Bind-It™ Patient Care Packs come with complete instructions. They detail what surfaces to clean in the washrooms, bedrooms, etc. The instructions detail storage of contaminated paper towels, how to treat laundry, bed sheets, etc. - virtually everything they need to know and do to minimize the chances of exposure to others. Presented in straight forward, easy to understand language. Best of all, we encourage you to call our 800# if you have any questions or concerns. * ALARA is for everybody - especially children. With a tool made just for patient use, doesn't it make sense to protect your family? Bind-It™ Decontamination products have a proven record of superior performance. For over 20 Years Bind-It™ has been used by Nuclear Medicine departments, Nuclear Pharmacies, Veterinary clinics, power plants, oil companies, and even the space industry. Bind-It™ is used worldwide in over 30 countries. Bind-It™ is very effective at removing all radiopharmaceuticals. There are no other products on the market that are as effective at removing I123, I125 and I131. Bind-It™ is the preferred radioactive decontamination product everywhere. Bind-It™ Hand and Body Soap is the only radioactive decontaminant designed specifically for use on skin.